Stratasys announced that two of its 3D printed pieces, which are incorporated into dresses by designer Noa Raviv, are featured in “Manus x Machina: Fashion in an Age of Technology,” a new exhibition that opened last week at The Metropolitan Museum of Art (MET) in New York. The exhibition, which is curated by Andrew Bolton, explores the dichotomy between hand-made and machine-made fashion and highlights 3D printed designs from talented designer Noa Raviv’s “Hard Copy” collection, produced using advanced, multi-material 3D printing technology from Stratasys. Mr Bolton said the exhibition aims to break down stereotypes about hand-made and machine-made garments and shows that both can be luxurious pieces of art. “While traditionally assumptions link time-intensive delicate designs to hand-made fashion, technology has caught up and developed so much that nowadays, machine-made clothes are every bit as complex and delicate as handcrafted designs,” he said. The dresses feature a series of 3D printed black-and-white pieces, enabled by Stratasys multi-material 3D printing technology and hand-sewn on ruffled fabrics and grid-like patterns. 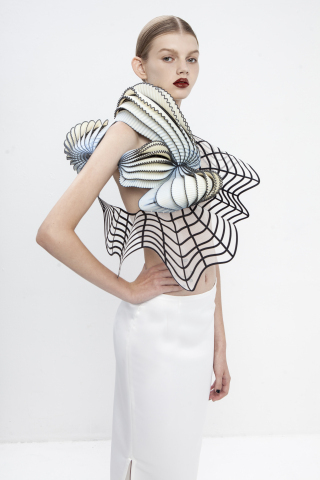 Stratasys said these voluminous shapes were produced on its Objet500 Connex3 Colour Multi-material 3D Printer, allowing Raviv to realise her vision of non-symmetrical distorted grid patterns and shapes. “The technological capabilities of 3D printing open new doors to areas of design previously not possible with hand-crafted fashion,” Raviv said. Naomi Kaempfer, Creative Director, Art Fashion Design, Stratasys, said the company was “very excited” to be part of “Manus x Machina” through its collaboration with Noa Raviv. “The exhibition explores the contrast between hand-crafted and machine-made design, which fits very much within our objectives of showcasing the design freedom that can be achieved using 3D printing technology,” Ms Kaempfer said.